Haha! Well, all's well that ends with cheese. Mmmm - I love fondue...good result! Sara, I am envisioning you walking The Husband on a leash, while he sniffs out the best dinner on all four! Good thing you are flexible, fondue is a good choice when done well especially if it's cold/cool outside. I am a planner too, another reason I like you besides your fabulous blog. I love your humor, Sara Louise! Flexible with a decent bottle of red is the best way to fly! Have a good one! Ohhhh typical husband behavior! Will we ever learn? haha Fondue is such a fun group outing though. ROFL! And as we learned the other day, the husband needs to eat! You can't go wrong with fondue. So, I'd say his nose was a winner this time even if you did have to walk in the rain. That could have ended badly... but the fondue and red wine combo sounds rather good! 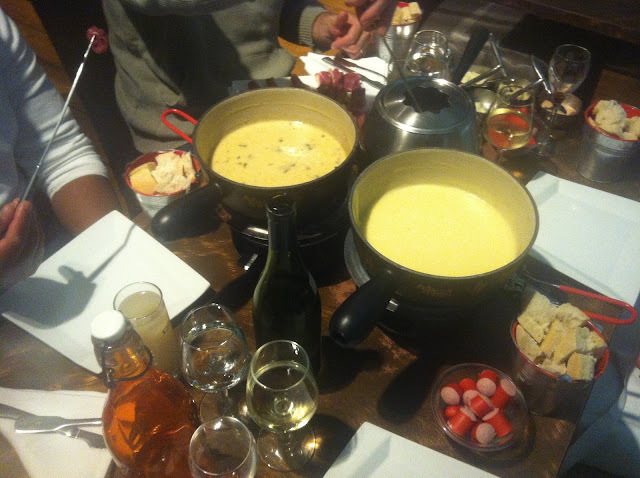 Mmm fondue!! This story is so funny! I love your line "if you aren't flexible, France will make you flexible!" - how very true. You must have felt quite hungry by the time you finally sat down to eat. I had my first fondue in France several years ago. It's such a sociable thing to do and delicious! Love this post! The way you tell the story makes me smile so much. Hard for me not to complain then but to just let them do their thing. At least it ended with a full belly and melted cheese. Having been on a nose hunting trip with the Husband and Canadian...I can attest to this method of restaurant hunting. Love it. I love carpaccio too. At least your dinner was interactive, lol.